W.M. 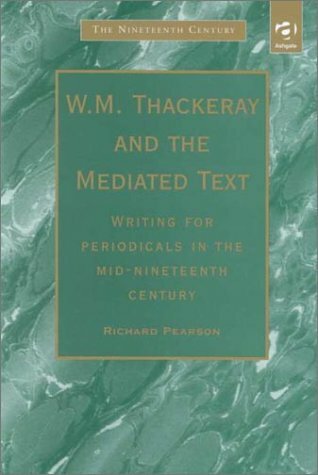 Thackeray And The Mediated Text: Writing For Periodicals In The Mid-Nineteenth Century (Nineteenth Century (Aldershot, England). ): 9780754600657 Hardcover - LIMEROCK BOOKS INC.
Thackeray's "minor writings" remain caught in a debate about what constitutes "literature" and whether magazine writing and journalism might be construed as such. This debate was present during the inception of the mass periodical press in the 1830s when Thackeray began his career and forms part of the context of, reasoning within, and techniques of Thackeray's work. Throughout his career, Thackeray was enmeshed in critical arguments about periodicals, novels, "realism" and commercialism. He was himself both (and neither) journalist and literary artist and was at once a product of and critical of emerging writing practices. This book argues that an understanding of Thackeray's writings for periodicals and the literary and commercial context of these is central to an understanding of his literary achievement. Focusing principally on the foundational part of his career, from 1833-1847, but relating this to the novels, particularly "Pendennis" and "The Adventures of Philip" and the "Cornhill Magazine" of the 1860s, the book explores Thackeray's ambiguous response to the burgeoning periodical press, and considers his negotation and critique of the market-place through a variety of publishing media.